PTB: I think it’s fair to say AvX went in a lot of unexpected directions throughout its run (e.g. the Phoenix Five, Dark Cyclops) most of which I came to enjoy even if I was skeptical at first. Hands down the thing they got right here was both sides being both right and wrong. Cyclops thought the Phoenix could be controlled by Hope and would restore the mutant race and in the end he was right. It doesn’t justify the horror he’s responsible for, but leaving the possibility that if the Avengers had left things alone it might have turned out differently was intriguing. Granted without the Avengers stepping in Hope would never have trained in the way of the Iron Fist and wouldn’t have had the Scarlet Witch as a guide. That’s a structure really works for me even though she was well trained for her destiny by Cable. KevinMLD: The problem for me is that I felt they really needed a good reason for the two groups to go to war in the first place. The Phoenix coming could have been a good catalyst, but not as depicted on the page. 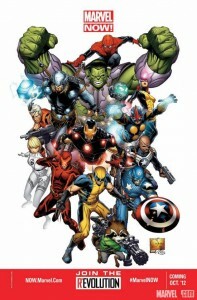 What exactly was the Avengers’ plan for Hope that was so much better than whatever the X-Men would have done. What if Cyclops had said, “Sure. Protect her.” There was no plan, at least not one that we saw in the main book. As a result everything that happened in the series between the two teams felt contrived. PTB: That’s a fair criticism. A lot of responsibility falls on Captain America and Iron Man for not considering the consequences of their actions to intervene and the long term planning was never apparent. Whenever we read the same book, I’m always curious about what you’ll think of the ending of stories that, by design, don’t have true endings. Was this enough of an ending for you? KevinMLD: I was fine with the ending as far as this series was concerned. I felt like there was a lot of missed opportunities, but Cyclops gets beat by the Scarlet Witch and Hope. “No More Mutants” is undone. It’s as good as any other ending this story was capable of producing. Would it have been preferable if Iceman or Scarlet Witch had been as involved in the first ten issues of AvX as Captain America and Iron Man were considering the huge roles they would play in the climax? Sure. PTB: There was great symmetry between this series and House of M and I was really hoping for that. I’m concerned about the emergence of new mutants being handled sensibly as “No More Mutants” led to some great X-Men stories, but I couldn’t agree more that more Scarlet Witch would have been nice. I would have gone in a different direction with Iceman though. In fact, there are a number of characters that suffered consequences I’m not crazy about and others that should have been capitalized upon. Havok (Cyclops’ brother) is a favorite character of mine so I’m biased, but using him here would have made so much sense empirically. He’s immune to Cyclops’ powers and absorbs cosmic energy. Who better to fight a cosmic Scott? 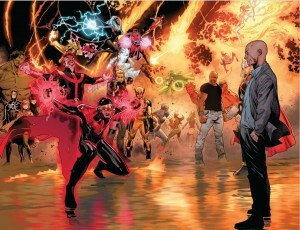 Plus, Havok is also starring in the centerpiece title of Marvel Now!, Uncanny Avengers. They got him onto a few panels throughout this series, but it was tough reading Iceman referring to Cyclops as being “like a brother” in his plea to Professor X to intervene with Havok standing right next to him in the panel. KevinMLD: I really don’t care about Havok like you do, but Iceman’s pivotal role was ridiculous. In no other form of entertainment would the reader/viewer be expected to know the nature of a character’s immensely long history with a main character when they appear on screen for the first time at the end of the story. It’s bad writing. Iceman should have been a bigger part of this story and had emotional story beats building up to that moment if he was going to have such an impact on the finale and the same would be true of Havok. Only in comics do writers think it is ok to assume the audience knows everything there is to know about characters that appear for one page. PTB: Absolutely. Another character that was mystifying in his absence was Cable. He’s another character I really enjoy, but why publish an AvX prequel, Avengers: X-Sanction (which we discuss in detail here), specifically designed to bring him back from his apparent death in X-Men: Second Coming only for him to not appear on a single panel? He’s also a big enough part of Marvel Now! that he made his way on to Joe Quesada’s teaser image. KevinMLD: I totally agree. X-Sanction seems pretty pointless now. Not Countdown to Final Crisis pointless, but still pointless. PTB: I know deaths are pretty meaningless in comics, but I have mixed feelings about the death of Professor X. Obviously it’s huge considering he died at the hands of his star pupil and the scene was full of emotion, but I did consider whether an end-around showing he’d duped Cyclops, followed by Xavier having to take down his adoptive son, would have been more interesting to me. A lot of this is in light of the fact that Xavier appeared to die at the end of Second Coming as well, and Mike Carey did tremendous things with the character X-Men: Legacy. Killing him feels wasteful by comparison. KevinMLD: As someone who only follows Marvel’s big events, I did feel like I just saw Professor X die in Second Coming. So I definitely agree. I think the real reason they took Professor X off the board is the impact his death will have on the All New X-Men who are displaced from the past when they become aware Cyclops killed him. PTB: Xavier’s death also opens the door for a very interesting story in Marvel Now!‘s X-Men: Legacy relaunch starring Professor X’s son Legion. Xavier was trying to help Legion control his immense powers away from the X-Men and Utopia, and the two even appeared together in a panel during AvX. Xavier’s sudden and violent death at the hands of his greatest soldier has huge story potential for the troubled Legion. KevinMLD: I can’t help but wonder why they made such a big deal out of bringing the Hulk into the series at the beginning of issue 11. That scene felt like one of the most deliberately conceived moments in the entire series to me considering the way it slowly built suspense before the final reveal, but it had no real pay off later in the story. Why not devote those pages to someone who mattered to where the story was going like Iceman or Scarlet Witch? I personally might have liked that issue less, but that’s besides the point! They’re not supposed to be writing these comics for me specifically. PTB: Hulk was keeping Emma Frost busy during the final battle, but even that wasn’t given much attention, but Olivier Coipel did try to showcase them in the background of AvX #11. As the art shifted around from issue to issue in this series, John Romita Jr.’s artwork through the first five issues was what you’d expect from the artist on what is essentially a team book. He’s a polarizing figure but this was neither his best not his worst work. 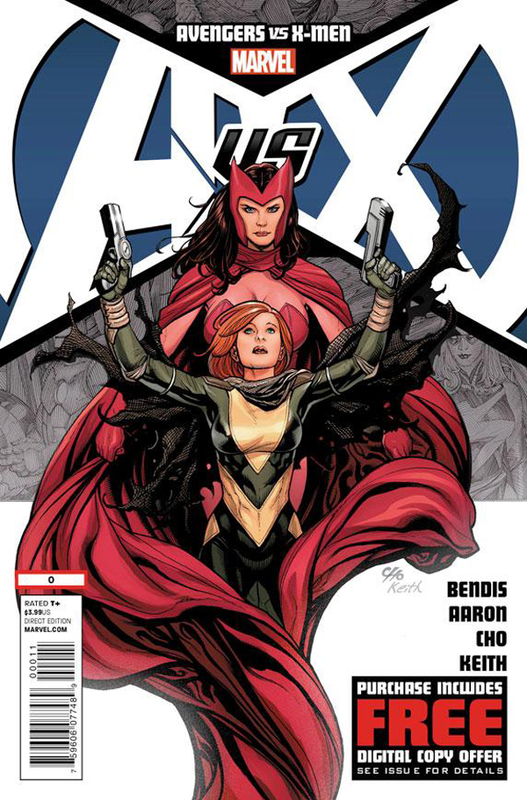 KevinMLD: I really thought his art in AvX was about as bad as I’ve ever seen from him and that it definitely damaged the quality of the first half of the series. And considering that’s when we were getting to see Avengers vs non-Phoenix influenced X-Men, that’s the stuff people were paying to see. Those issues should have been beautiful. Where is the guy who drew The Eternals? PTB: The moment Coipel entered the scene everything changed both literally and figuratively. It was fitting having the artist from House of M draw the world as it fundamentally changed at the hands of the Phoenix Five. It added visual symmetry to go along with the story threads shared between the two events. Plus it was gorgeous. Adam Kubert was rock solid as usual. My only real complaint was the scheduling of artists merely because it didn’t follow any logical pattern. It’s trivial though. If the series is going to have more than one art team it hardly matters who draws which issues and it was nice to end with the two artists I appreciate more. I knew I was in for the whole event though. KevinMLD: Agreed. The series really took off when the art changed over and Cyclops unveiled his cosmic Nightwing amalgam costume. PTB: There were some great tie ins for this event, but they suffered their share of continuity gaffs. Wolverine bounced between Antarctica, his school, and back before traveling to the moon. Xavier erased the events of an entire issue of Avengers. These were a bit more egregious to me than some of conversations in the final scenes not playing out identically across different books. 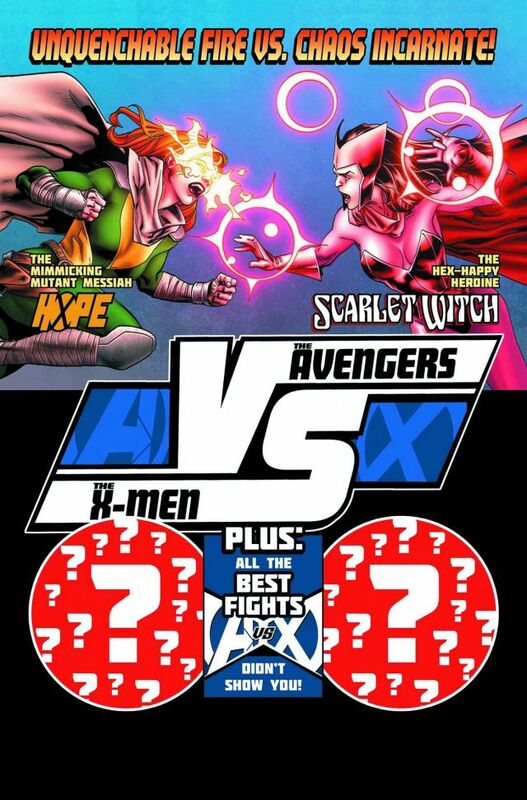 KevinMLD: I skipped the tie-ins except for the fun AvX: Vs. #6, which was definitely an enjoyable read. PTB: That series ran hot and cold for me, but the final issue was pretty great from start to finish. Brian Bendis’ Iron Fist stories in New Avengers were perhaps the best in my opinion, closely followed by Kieron Gillen’s Uncanny X-Men. Gillen worked many of his ongoing plots from the series into the framework of the event seamlessly. I found it really impressive, and the issues which were tied closely to the event were also well done. All in all, Avengers vs X-Men did realign the relationships among the heroes of the Marvel Universe and that could mean good things for Marvel Now! Compared to most of the recent events it seems to have created a more stable status quo where some new stories can be told without the sense that readers are in a holding pattern waiting for things to return to normal. We’ll get our first look at how effectively that’s done today with the release of Uncanny Avengers #1.